For Punarvasu births of a masculine valence, the condition of prosperous, preaching, inclusive, broad-scope, philosophical, humanistic Guru may considerably affect the outcome. Masculine births under auspice of Puna, Visaka, or Purvabhadra may find that their worldview is greatly shaped by the character of priestly teachers and guides. For those born into the paradigm of Jamitra, teachers, preachers, professors, patrons, agents of generosity and guidance, guru-figures, ideologues, indoctrinators, theorists, know-it-alls, proselytes, philosophers, pontificators, patriarchs, pundits, pater-nosters, proponents of principled understanding, wise-ones, wizards, druids, and paradigms of belief may be especially influential. Guidance is provided by emissaries from the realm of the Twin Gardeners called Castor-and-Pollux. Their purpose is restoration, renewal, and rehabilitation of lost knowledge. High forehead. Punarvasu have a global perspective. The majority of Aditya-born nativities are higher dimensional Seva-wanderers who assume guidance roles. Mithunaya pada 1-2-3 represents Guru's rulership of 7-agreements ++ 10- leadership, while also expressing the tension between broad-view Brihaspati versus detail-oriented Bantering Budha. Pada 1-2-3 are blessed with an expansive capacity for evocative description or inspirational speaking. Often excellent writers who can facilitate spiritual growth via specific explanation and detailed description. Pada 1-2-3 are often found in the literary arts, in teaching roles, in academic advising, as travel guides, and as poets who describe the natural world. Karkata-pada-4 represents Guru's rulership of 6-imbalance ++ 9-philosophical principles. Pada-4 also embodies the tension between global, paternalistic Saptarishi versus local, undulating, motherly Somana. As master gardeners and natural herbal physicians, they understand the wisdom of the mineral, plant, and animal kingdoms. Pada-4 may also emerge into the religious professions where they may grow a garden of psycho-intuitive understanding that develops into doctrine. Although the Higher Teacher seeks wisdom, for Karkata-Punarvasu the guru-figure may also be adversarial, impoverished, polluted, or ailing (due to Brihaspati rules 6). "... from Arudra to Punarvasu, a startling change in mental development. capable of delving into and understanding all manner of philosophical and metaphysical postulates. and has a lively and profound imagination. which is the result of an unusually passionate temperament. although unlike the Arudra native, he will not experience poverty." 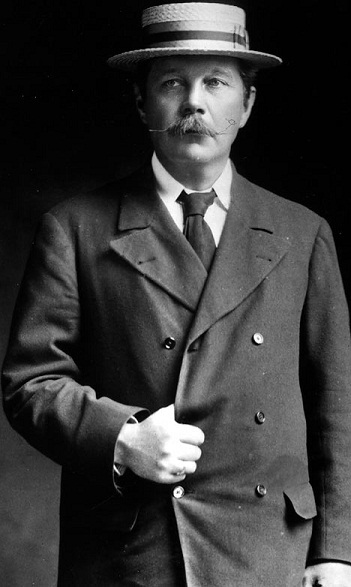 Sherlock Holmes 1859-1930 occultist Arthur Conan Doyle * Budha-yuti-Zukra. Raised with conventional religious assumptions, C-D left the foundational (4) rites in order to pursue what he perceived as a higher level of wisdom, which he detected in the psychic spiritualism of his day. Dad = Charles Altamont Doyle .When C-D was young, dad suffered a severe mental breakdown, which was poorly diagnosed and violently mistreated, leaving Father with a terrible addiction and a destroyed ego. Father suffered alcoholism, epilepsy, and severe depression . Dad self-medicated with alcohol, to the extreme of drinking industrial poisons in his disordered distress. His father despite high birth rank was remanded to an insane asylum and the family plunged into poverty. 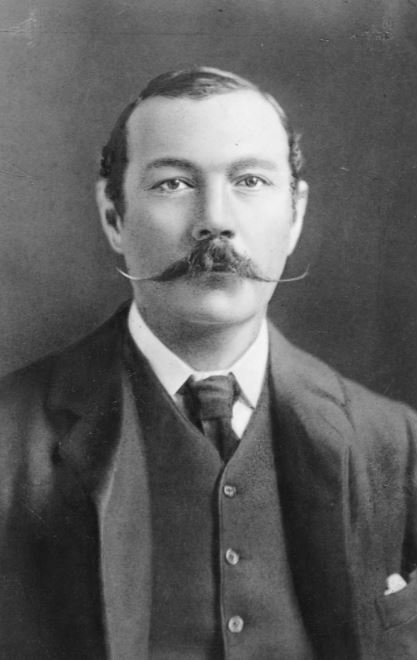 Conan-Doyle visited his father periodically and even included his father's artistic illustrations in some of the Sherlock Holmes serials, but dad was never released from the insane-prison. After Charles Altamont Doyle's mental breakdown in mid-life, dad was institutionalized permanently, leaving the family in a state of struggle . Surya in bhava-12 suggests an invisible father. Mom developed a second, undisclosed alliance Chandra-8 . Thus neither parent is much supportive albeit there remains a safety net composed of uncles. friends of the family, mother's companion. Despite the grim prospects of 'dual diagnosis' mental illness combined with extreme alcoholism, dad was an artistically gifted and productive illustrator. C-D maintained a lifelong relationship with his mother, but she was a secretive person Chandra in classroom-8 and not much is known of the details of her life. She knew about and even chaperoned his hidden affair-du-coeur of nine years while his wife was ailing. Chandra-8 + parivartamsha + mutual exchange + Shani-2 lends stability and longevity to the maternal role in his life. C-D's first wife wife Louise was the steady object of his dutiful affection. She is represented by Shani in 7th-from-Chandra ++ parivartamsha. As their two children were growing, Louise (Touie) became profoundly ill with tuberculosis (grief), and physicians expected her to die shortly. However, Louise lived in frailty until 1906. C-D met Jean in 1897 some three years after Touie's terminal TB diagnosis. 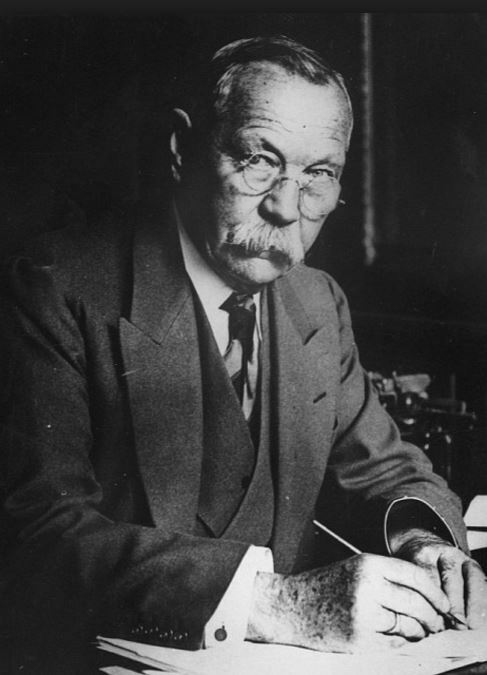 Due to the Victorian morality of the era and his own penchant for secrets Chandra-8 and also due to Rahu-9 , Conan-Doyle and Jean entered into a thrilling (Rahu) 9-year clandestine arrangement. The second marriage lifepartner was characterized in Rahu style as a producer of flattering accounts via automatic writing in the spiritualism movement that held their fascination during C-D's later years. Jean was 18 years his junior (Rahu). She liked glamour and celebrity. She was described as an opportunistic, mesmerizing, and taboo-breaking personality characterized by her competitive horsewomanship, her operatic singing, and her participation in their 9-year extramarital affair. C-D was said to be smitten, but critical observers opined that her influence led him to over-extend himself (Rahu) into the world of spiritualism (9) which eventually caused his downfall (Rahu high rise downfall) due to a fake-photo scandal. A remarkable double parivartamsha++ viparita raja yoga harsha yoga ** allowed C-D to describe the most heinous and gruesome crimes and explore the world of criminal insanity with no harmful consequences. In fact, he built a tremendous career upon materials of violent crime and social disease, due mainly to the benefits of Mangala rogesha providing a powerful Vimala Yoga. 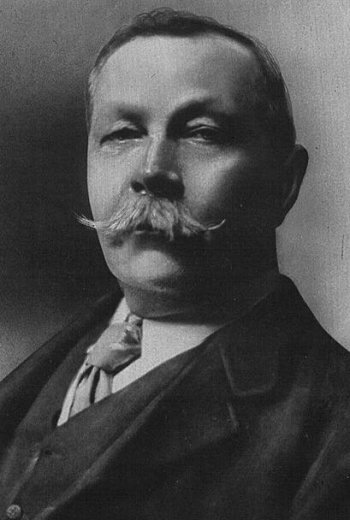 Conan-Doyle belonged to a large community of occult practitioners He had a large fan-base of devoted readers for decades, and his income was eventually quite substantial. His widow lived from the proceeds of his literary estate for the rest of her life, and his children also inherited some profits. C-D regularly about national politics and giving his characters a thoroughly British profile. 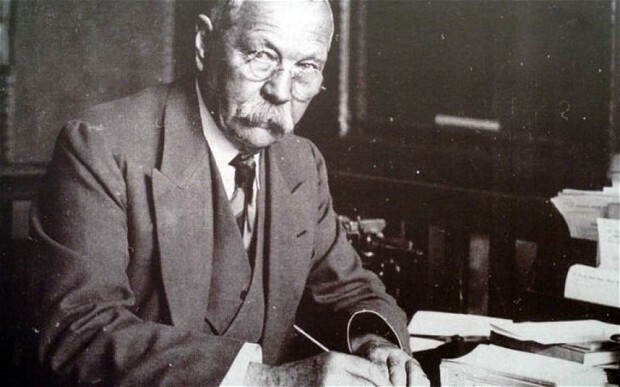 A staunch home-owner, who once left Britain moving to Switzerland for his wife's health, but couldn't endure the loss of familiar habit (4) and moved back home. Guru-1 receives amplifying drishti of Rahu. Guru-1 rules Meena Arudha lagna = bhava-10 C-D provided several varieties of social leadership, but with karmesha in 1 he was best known just for being himself. Overwhelmingly his British reputation was characterized by his leading role in the psychism of the day = Meena imagination dreams. Shani in bhava-2 * must preserve, have to collect, catalog, tell tales, speak-and-sing; cautious banking; tense or punitive family, chronic financial depression + eye-teeth , heavy pressure against speaking out; insufficient nourishment, desiccated preserved food. Limited sight, blindness. Rahu in bhava-9 * passion for philosophy, preaching * in swabhava of Saptarishi Guru, the Shadowy Specter seeks privilege via glamorous or unusual doctrine, theory, dharma, worldview; desires a special, important teacher-preacher role in catechesis, principled discourses of abstract ideas, ideology, philosophy. Extraordinary father-figure, ambitious professors and religious teachers. Thrives in culturally-mixed university, temple, sangha, or sacred-teaching settings. Rahu the Poseur may pose as a charitable philanthropist, a wisdom-purveyor, a patron of principled thought, a guru-figure, a philosopher, or a globalist humanitarian. Exciting, opportunistic third marriage (if any). C-D had five children via 2 marriages. However, none of his children had offspring = he had no grandchildren. His lineage thus died out.